You’d think that with it raining almost every day since I arrived in London several days ago, I’d be keeping a collapsible umbrella in my purse. But that’s what sensible people do. Instead, my go-to rain solution has been to run for cover under the closest roofed thing that’s nailed down and taller than I. So when it started to rain while I was walking around in Southwark area, I made a beeline for the train underpass on Union Street. It met the two requirements. And that’s when I saw something at the corner of my left mascara-streaked eye. A sign bearing the Thai flag. Bangkok Kitchen. Hot Thai food. It seemed … out of place, unexpected. You see, I’m not very good at finding stuff. As I’m typing this, I haven’t been able to locate my phone in three hours. But when it comes to food places, it seems I’ve never had trouble finding them. Apparently, as is the case with this one, food places don’t have trouble finding me either. But that’s not the point. The point is — intrigued by the sign and enticed by the scent of warm curry, I had to check this place out. The actual shop couldn’t be seen from the street, but I just walked right on in. And it has proved to be a memorable case of veni, vidi, comedi. Right off the bat, there’s something reassuring about the condiment table. No trace of the American sriracha sauce or packets of soy sauce or plum sauce in sight. No chopsticks in the utensil tray. Imagine that: no chopsticks on offer; just spoons and forks with which to eat your rice-curry meal. Nothing wrong with chopsticks or eating with chopsticks, of course. They’re just not made for the purpose of eating rice and curry on a plate which is what the Thai people do. Lawd, if I wasn’t afraid she’d pepper-spray me, I would’ve given the woman a grizzly bear hug right then and there and never let go. Instead, I let out a sigh the way they do it in movies and gave her a 5-second stare of respect, intense enough to be meaningful without crossing over into the creepy territory. All kidding aside, I really do respect these hard-working people who strive to keep the integrity of their cuisine and culture. This 4-year-old place is as unpretentious as can be. For all intents and purposes, this is a rice-curry shop (ran khao kaeng ร้านข้าวแกง) — like one of the millions out there on the streets of Bangkok where you go for a quick meal of rice topped with whatever dish(es) you pick out of the many that are available. It doesn’t seem to aim at being anything but a regular rice-curry shop. Bangkok Kitchen is not a hi-brow restaurant and it doesn’t appear it has any interest in being one. You don’t go to a rice-curry shop to be wowed by the presentation, hard-to-find ingredients, one-of-a-kind dishes, or anything out of the ordinary; you go there for decent, inexpensive, everyday eats. And while, sadly, some sit-down fancy restaurants in London that aim high can’t deliver those things, Bangkok Kitchen aims lower but meets all the expectations. There, you approach the steam table located inside a small bamboo hut, you point at whatever you’d like on top of your plate of rice, you take your rice plate, you grab a cold drink from the fridge, you stop at the condiment table to help yourself to some nam-pla prik or what have you, then you go sit at one of the communal picnic tables to enjoy your meal. Looking around, trying my darnedest not to stereotype, it was hard not to notice how strikingly savvy this group of Londoners seemed to be when it comes to Thai food. There’s something about the people who come here, identified by Wanvipa as the regulars, that has left a positive impression on me. Some people arrived in cycling shorts; some in business attire; some in ragged jeans and flip-flops. But they all seemed to have much in common and formed a tribe of sorts. I knew nobody there, but amidst the cold drizzling I didn’t feel alone. We were eating, talking, like we’d met and shared a meal before. Take one of my table-mates, a Darren Criss doppelganger, for example. I don’t know what I admired more: the tale of his last trip to Bangkok or the fact that he was mixing the curry into his rice with the level of deftness expected of someone who’s done this all their life. But the most important thing is the food. I haven’t eaten at every Thai restaurant in London, of course, but the ones that I did have been ho-hum. Not this one. That’s what I told Wanvipa. “You like the food? Really?,” she seemed surprised. For the life of me, I couldn’t understand why she would be. A case of humility and fear that unless you’re formally-trained or have the ability to hack other people’s century-old family recipes, you’re not a respectable Thai cook, I suppose. Or maybe she, like many, has bought into the notion that the face of Thai cuisine is represented only by restaurants serving the so-called royal Thai cuisine and not these street-level, “lowly,” no-frills rice-curry shops. But if Wanvipa had dined with me at a swanky chain Thai restaurant a few evenings prior, she would have understood my reaction. If the creamy, goopy, homogenous red curry and candied Pad Thai I had there were a bacterial infection, the food at Bangkok Kitchen would be penicillin. The curry here is done in the manner as you’d find at a mid-range, respectable rice-curry shop in Bangkok. 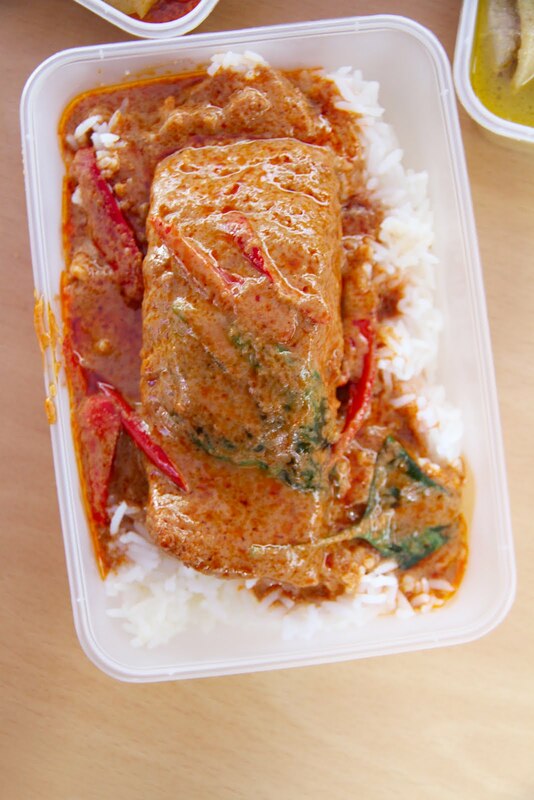 Salmon chu-chi (labeled “shushi”), fillets of salmon in thick red curry sauce, hit the spot. I could go without the chicken and cashews, but all the curries I had reminded me of home. “That’s all you need to do,” I thought. 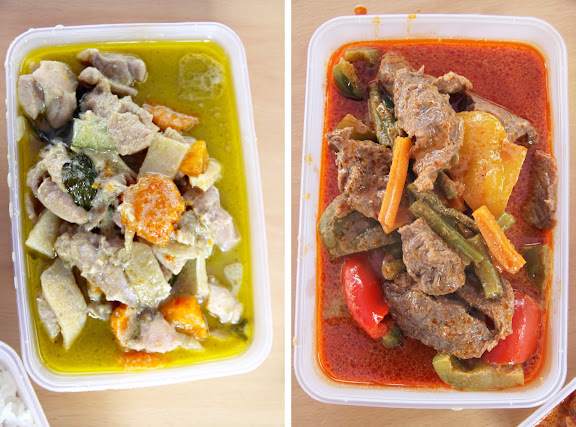 Wanvipa, an Isan (northeastern Thai) native with a degree in journalism and mass communications, had only recently learned how to cook the dishes she now serves at her rice-curry shop. She scoured the Internet for recipes and tweaked them until she’d arrived at what she thought was good for herself and her Thai friends. Having spent a few years operating tours in Samui, she’d also added a few southern Thai dishes to her cooking repertoire. 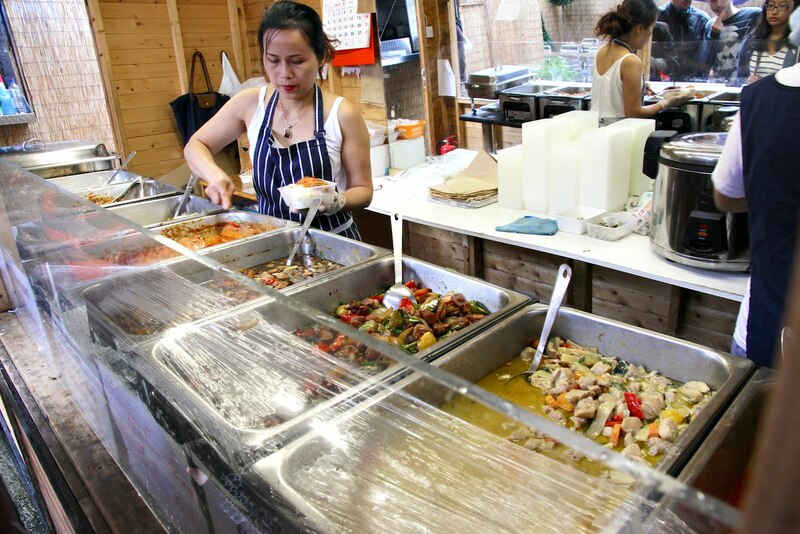 Londoners, on your lucky days, Wanvipa may sneak the iconic southern dry curry, khua kling (คั่วกลิ้ง), into one of the chafing dishes. She’s done that from time to time. Would this rice-curry shop survive at this level of performance had it been located in Bangkok? Honestly, I can’t say. It depends, I guess, on its target clientele and location. But this shop, doing what it does at this level and price range, is a gem in the heart of London. And if you live there or visit the area, I wholeheartedly recommend this little place which is just a stone’s throw away from the famed Borough Market. No website at the time of publication. Selections on the steam table rotate from day to day. Diners can also order one-dish meals, e.g. Pad Thai, Pad Khi Mao, Pad See-ew; they are made to order. *They have three other branches in St. Paul’s, London Bridge, and Waterloo. Call to inquire about the exact locations and hours. Forgive me for questioning you, but I understand that chopsticks are not used in Thailand. I believe that fingers are traditionally used in addition to spoon & fork. I’d be interested to learn differently!! I love those little back street places but the presentation can be off putting to some. Debs – Chopsticks are used to eat some (not all) Chinese-influenced dishes such as noodle soups. But, yes, traditionally it’s fingers (obsolete practice) or spoon & fork. Sine I’m Thai who live in Bangkok, I am really appreciated to know that there are excellent Thai restaurants throughout the world. All dishes above look great for me. If I have a chance to visit London, I’ll go this Thai restaurant first! Im happy to hear your enjoying your time in London despite the rain.It can be such a colorful city when the sun does come out.There is a thai temple in wimbledon and a nice Thai supermarket called Muay in Earls Court Hogarth Rd which sells all sorts of stuff like homemade curry pastes and pigs blood.I now live in the south of France but used to stock up on thai goodies when i came back to London.Have a nice trip and i hope the sun comes out for you! Very well said. I completely agree with you. Hello, I’m in total agreement with you on your preference for the lower end Thai eateries. Your comments are also definitely applicable to Melbourne Australia. In saying that I don’t suppose you managed to find time to visit David Thompson’s restaurant Nahm while you’ve been in London? I would be interested to hear you thoughts. This blog is great! I like Thai food. This good for me.So, Thank for this blog…..
Wow! I literally live in and around this area and have never seen or heard of this place. Next time you’re in London please shout for some other hidden gems. Fabulous! Never knew about this place but I’ve got to give it a try! 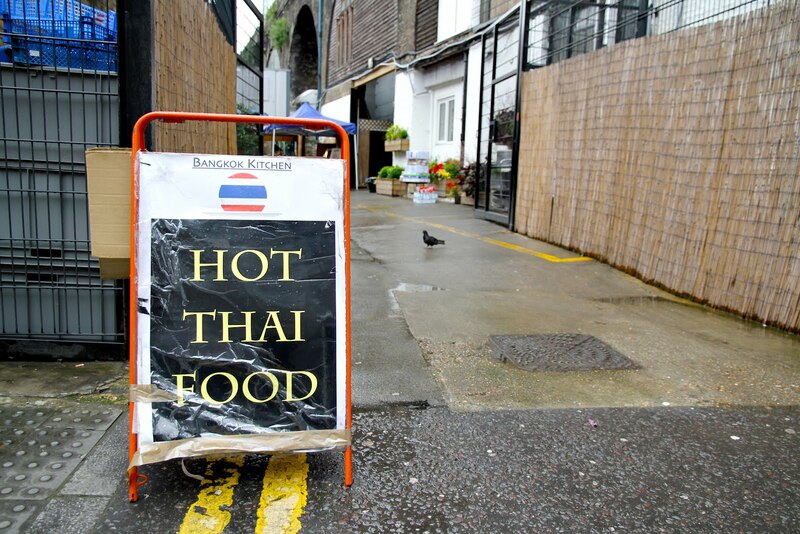 I couldn’t agree more, I Thai and I used to work around London Bridge, that place was an absolute joy of my lunchtime! Good, honest food with true Thai taste indeed. Why would you be so happy to see them not have chop sticks? Is it cos you think you are better than East Asians? No, we (speaking for myself) are happy to not see chopsticks because we don’t eat curry and rice with chopsticks. It’s a sign the establishment isn’t pandering to misunderstandings. It’s that simple, Andy with an inferiority complex N.
Is it too hard for Thais to use chopsticks with rice? I know they use chopsticks with noodles so why change utensils when eating rice? Chopsticks work fine with rice. This place is amazing. I go there once a week for lunch. Get the fresh wok cooked noodles and prawns. the bonus is all the condiments that you can pile on after. A real gem. This is one the best lunch deals I’ve found yet around the city. 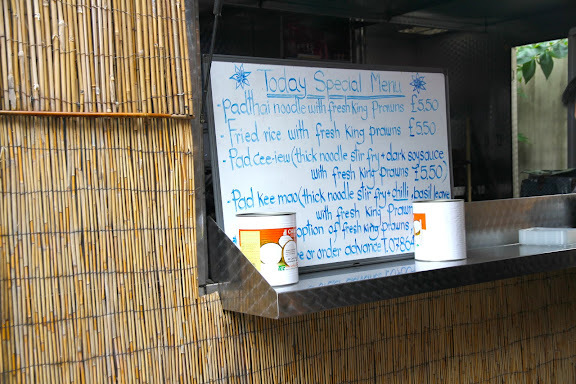 I go to the London Bridge stall and the St. Paul’s stall (nearer to Bank actually) quite regularly and I absolutely LOVE their flavours and portion sizes (always pad thai base with a half/half of curries, or even 3 if I’m feeling greedy), and for only £4.50! So I had to pay pilgrimage to the mothership in Southwark, and it doesn’t disappoint. What it offers for 25p extra is more variety: 6-8 options per day instead of 2-4, or the made-to-order wok to the left for £5.50. Personally I still prefer the curries since I feel their stir-fries lack the flavour and richness their curries gain over long periods of simmering. Also, free brown and white prawn crackers on Friday lunchtimes! Make sure to go early in the first half hour before they quickly run out! 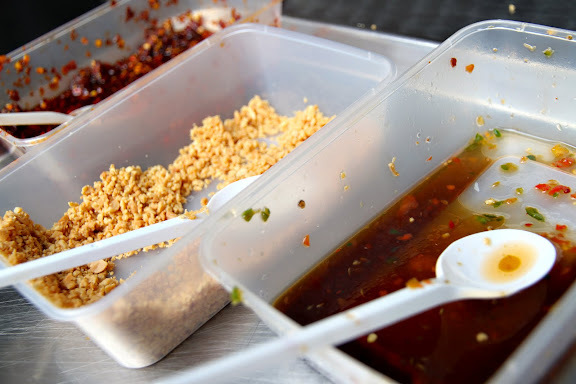 I hope you don’t mind but I have linked to your review of Bangkok Kitchen as I’m organising a SE Asian street food market in October with Bangkok Kitchen hosting and you really have the spirit of their stall down to a T – just perfect. I eat there a couple of times a week and never tire of it!